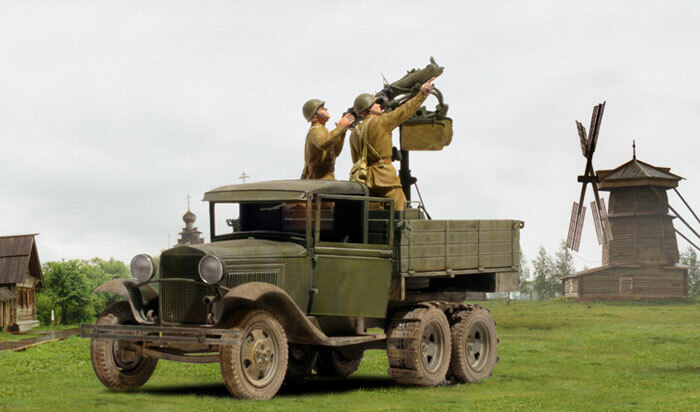 The Red Army's standard low-altitude air defense system in 1941 was the 4M, a quadruple mounting of the Maxim machine gun, adopted in 1931. 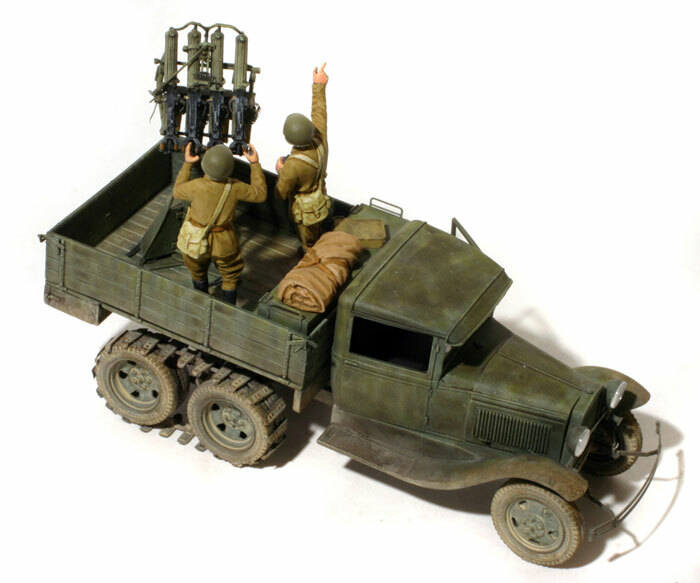 Mechanized units had these mounted on GAZ-AAA trucks. 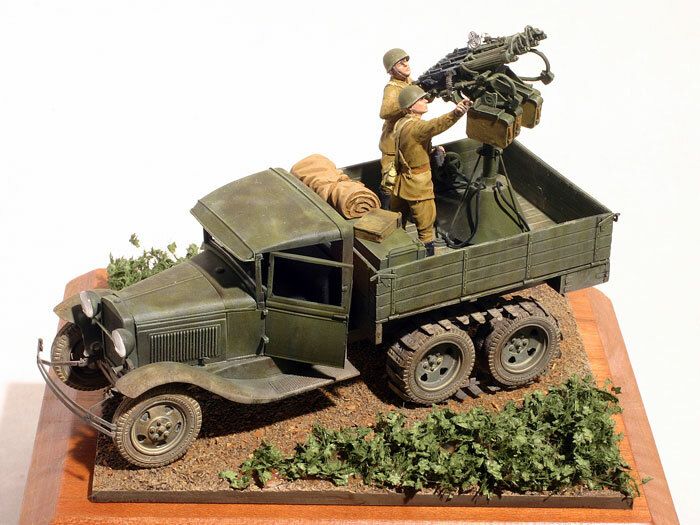 I became interested in doing this combination with the release of the 1/48th scale UM GAZ-AAA truck and the Rest Models resin 4M and crew. Having built some UM 1/72 offerings in the past, I waited for the aftermarket stuff to show up, and Hauler released three sets. The most useful of these is a set of superb resin wheels which replace the vinyl tire/plastic wheel set in the kit. There is also a useful set of photo-etch detail bits, and a set of all-terrain tracks which I also used. The tracks are time consuming to construct and finicky to attach, but they add a bit of interest to the model. The Rest Model set from Ukraine is difficult to find and I got mine from Track 48. It is a superb set containing three figures plus the gun mount. The detail is excellent and includes some photo-etch. Another very positive feature of this kit is an excellent set of instructions complete with reference photos and coloring instructions. 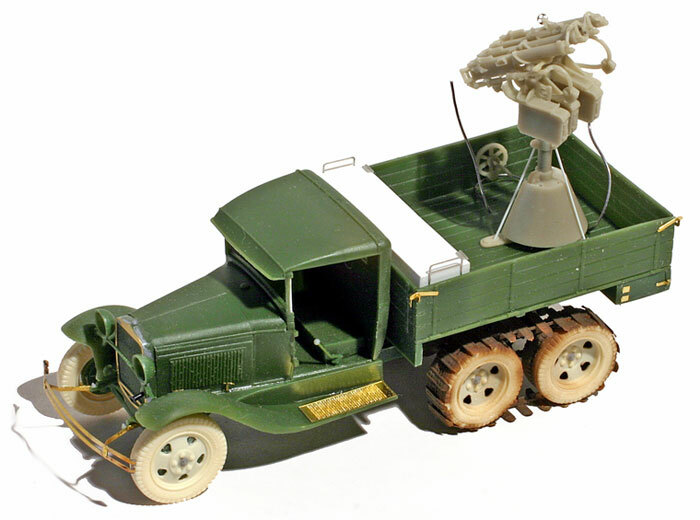 This can be built on its own as part of an airfield or headquarters diorama for those not interested in the truck mount. I only used two of the three figures as the back was getting fairly busy and I didn't want to hide the detail of the gun mounting. The UM GAZ-AAA reminds me of old Airfix kits in terms of detail. The detail ranges from excellent to simple and soft. I spent a bit of time thinning out parts, especially the front fenders. The part fit of the kit is generally good. The 4M version of the truck had a large ammo/tool bin behind the cab which I made from sheet plastic. Overall, this was a very straight-forward conversion, and I highly recommend both the Rest 4M and the Hauler after-market sets.